Build or Partner for Customer Relationships? Develop your own website or connect via trusted 3rd party platforms? This was a central theme at the recent eyeforpharma Marketing Customer Innovation Europe conference in London. The round table I was chairing saw strong views for each ‘side’. Those representing platforms that offer third-party visibility for pharma were keen to point out the value in ‘fishing where the fish are’. On the other hand, some pharma folk felt clear that establishing leadership via owned assets was the way to go. Really, the debate needs reframing. In most cases we should be doing both of these tactics. The balance we choose depends on our strategy: What are we trying to achieve? What does the customer need at different points in their journey, and what are the business objectives? Why a combination? Because every strategy needs to combine reaching new customers with building sustained relationships over time. A respected 3rd party platform may have a large membership and user base – check their statistics on your target audience. Partnerships enable you to offer up your content to as wide an audience as possible, demonstrating to relevant HCP groups that you are considered a trustworthy stakeholder in this area. EPG Online, Univadis, Medscape, Doctors.net and DocCheck are among those offering 3rd-party opportunities for healthcare companies. Every time you want to communicate with each customer, it costs the same as last time. There is a lack of economy of scale: as soon as you stop paying, your audience goes away. If you want to be a therapy area leader, an owned platform is a likely necessity. First of all, this is how you will get those all-important search rankings and ensure that customers are coming to you, instead of your competitors, to get their questions answered. Once on your website, customers will sign up to receive high-value content – if it’s compelling enough and meets their needs. This is how longer-term relationships are forged. Some companies are embracing this approach and building sustainable relationships, for example Sanofi with diabetes.sanofi.de, Lilly with LillyOncology.co.uk and Shire with the ADHD-Institute. Think you can’t form long-term relationships with customers in a digital-only setting? How about our relationships with Amazon, Google, or Apple – do we ever have a face-to-face meeting with them? Amazon has inspired loyalty in millions through its personalisation, effective search engine, breadth of product offering, and customer service. If we see an emotive video about a new Apple product on one of our favourite news websites, we expect to be able to click through to the manufacturer’s website to find out the product specifications. We wouldn’t have made it to the site in the first place without the third-party video, but it is only once there that we will sign up for newsletters or register for an account, forming a relationship with Apple. We use different types of websites for different reasons and our experience with a company in each type impacts our engagement in the others. Proof that it works in pharma? When developing LivingWithNets.com (Ipsen’s award-winning resource for people living with NETs, presented at the co-located eyeforpharma Patient Summit in London), we initially wondered whether a new web-based NETs resource would add any value for patients, and indeed whether patients would even visit a company-owned website. There was already the Carcinoid Cancer Foundation, a thriving US-based resource that meets patient needs on a global scale. Ipsen’s approach? Partner with the Foundation itself as well as patient associations in other countries to gather insights. They helped us to connect with patients so we could better understand their needs. It turned out that many patients were keen on the idea of an additional NETs resource to support patients from symptoms through diagnosis and living with the condition. This is an approach that applies for healthcare professionals too. If you want them to get to know you, customers first need to know you are there – so you must ‘fish where the fish are’. But once they have discovered you, the connection requires a space where you can deliver lasting value to the customer and get to know each other better. This is a sound approach to all relationships, traditional, digital or multi-channel. Pharma is Ready to be ‘Human’ in Social Media – and how I got blocked by Twitter! It would be an exaggeration to say we are already surrounded by brilliant examples of pharma using social media to meet patients’ needs. But at the international Pharma Social Media Conference last week in London, I could see that on the horizon. This year’s conference had a hungry buzz about it, with our colleagues in pharma really wanting to grapple with the question of ‘how’ to engage with patients, rather than just, ‘Should we?’. Much like at eyeforpharma, the mix was filled with crucial ‘newer’ partners such as biotech and medical device firms. Collaboration, the key to pharma’s future, is now a given. Co-creation with patients is the norm at Kanga. When I shared some examples in my talk (such as the MyFeelPlus app for prostate cancer patients), it sparked some great discussions – rather than merely the fear of regulatory constraints. Real, Relevant, Respect, Respond: the four Rs of social media that I outlined in my talk. Speakers gave solid presentations that touched on all of these. In a helpful case study, Sarah Holiday of Pfizer shared their strategy for congress tweeting for HCPs. Each team runs their own congress through the central @pfizercongress account. This makes the account a hub for SM-active doctors, while the posting is still done by teams with the most relevant knowledge. Alex Saunders provided insight into GSK’s social media approach, noting that ‘the content has to be brilliant or we’re wasting our time’. He explained their aim of combining journalistic editorial leadership with a culture of creativity and an ‘outside-in’ mentality. His presentation recognised that the most crucial information must be gleaned from those we are trying to engage with. It’s refreshing to hear a presentation like this. It signals the sea-change in big pharma that can help patients the most – and, in turn, ensure the industry’s successful evolution. Of course, LinkedIn does not allow drug promotion, including to HCPs. Engagement must take a different form and signpost to other assets. LinkedIn is an increasingly versatile channel. Its scope for connecting pharma with HCPs is considerable. Facebook is a vital tool for engaging patients. Maria outlined her top tips for getting the most out of it, in particular using FB’s Business Manager to run projects, which offers insights and functionality not available to an ordinary FB user. I noted in my presentation that when Ipsen’s LivingwithNETs (developed by Kanga, co-created with patients) won the eyeforpharma award this year, Ipsen’s share price saw a notable increase. Delegates told me afterwards that this fact had helped to confirm what they already knew: that the winners in our industry are winning because of their close attention to patients’ needs. The conference chair commented I was ‘tweeting like a millennial’ (must tell my millennial children 🙂 ) But on a more serious note, we were surprised that only a few delegates were tweeting or using any SM to share conference content. Cyril pointed out that companies with socially-engaged employees perform better in SM, and Jannick Larsen of Teva encouraged everyone to ‘become a thought leader’ on SM and share great content. We must all become participants in order to learn how to implement the key theme that emerged from the conference: Being human, treating people right in social media, is where patient, healthcare professional and business value are delivered. Patient centricity has been on everyone’s lips for a while, but many companies are now putting it into action. Bayer’s Einstein Junior program empowers children on clinical trials with age-specific materials co-developed with them and their parents. Sanofi’s Moski-Toon initiative seeds the spread of knowledge about malaria prevention in Africa using animation. The winner was LivingwithNets, Ipsen’s resource developed with Kanga, co-created with patients living with neuroendocrine tumours. As for the conference itself, the Patient Expert delegates fed back on a mostly positive experience. Still, I’d like to see more patients taking part in the presentations next time. At Kanga we think the patient voice should be ubiquitous. A glance around the conference revealed a wide variety of vendors, from Trustrack (a scientific copyright tracking platform) to 60 seconds (an app for coaching in mobile sales). At one time, ‘digital’ in pharma meant ‘digitalising the rep’. Now, I’m glad to see, it’s an infinitely broad term signalling the central means for direct-to-customer engagement. Roche have updated all job descriptions to include ‘insight-gathering’, demonstrating a commitment to providing the right kind of information to the right people at the right time. A platform at the conference was given to Share4Rare, an innovative project that uses social media to connect the stakeholders of rare diseases across Europe. True multichannel approaches are now valued and commonly known to be effective, driving value for patients. Companies are starting to realise that measuring digital activities is essential, as it provides the data they need to propel them into greater customer engagement and personalisation. Analytics and KPIs are a subject of concerted focus for most. Elena Bonfiglioli from Microsoft highlighted that, of all industries, pharma suffers the most from ‘pilotitis’. The accessibility of data is what can enable pharma to embark with real confidence on a broader range of projects to support patients and doctors. With the concept of a ‘digital native’ almost a moot point now, all doctors are digitally ‘naturalised’. This means they use digital devices and applications as their main professional and personal tools for communication, research, and other activities. We know that 99% of doctors are using Google for work. It was clear at the conference that the achievement of ‘owning Page 1’ with our brand – a basic brand hygiene factor in any other industry – was still not common, but the imperative to achieve this was stronger than in previous years – at last! Voices at the conference reminded delegates that today’s customer needs operate in a different plane from the make-up of the industry. One was that of rheumatologist Dr Deepak Jadon (Cambridge University Hospitals), who highlighted that patients very often use ‘Dr Google’ for information on their condition, and HCPs want them to be able to find credible information this way. The good news is that the transformation required to meet these needs is in progress. Pfizer, for example, have identified their 25 most time-consuming processes and made them more efficient, in order to make room for upskilling. Digital is finally being seen as a long-term reordering requiring strategic business transformation, not just a tactic. Innovations that make use of AI and Virtual Reality are finally getting traction as real business tools that can support patients and doctors. Janssen won the Most Valuable HCP Initiative award with virtual reality training for cancer nurses in Multiple Myeloma. The sheer amount of health data being collected – 90% of the world’s health data has been collected over the last 3 years – is too much for humans to make sense of. Enter AI and machine learning. Google has been rolling out voice-based symptom checkers. Merck is using holograms to help with surgery – the surgeon can call up any image or patient information as needed. Google has developed scans of eyeballs to let you know if you might develop heart problems, and wearables predicting IBD flares and diabetes. With Google & co. stepping up to fill gaps in patient need, the question of pharma’s role hung in the air. Clearly, continued investment in research into Alzheimer’s, cancer, heart disease and the 7500 rare diseases for which there is still no treatment, is critical. But how can pharma match what tech has to offer? Dr Wolfgang Lippert (Salesforce) spoke about ‘the rise of multi-stakeholder omni-channel engagement’ and ‘PRM (Partner Relationship Management) rather than CRM’. One outstanding example of this was Takeda’s sponsorship of the Cancer Alliance in sub-Saharan Africa, which led to a 70% increase in oncologists, 200% increase in oncology nurses, and more than 120 GPs being trained to spot early signs. Already, machine learning and big data analytics allow for automated segment-of-one communications. This means far better message sequencing and personalisation, and a view, said IQVIA’s John Procter, of patients as valuable ‘assets’ who need careful attention on an individual basis. Pharma will need to get much, much closer to patients. Though pharma is now doing plenty of patient engagement, these activities are too often a ‘point in time activity’ at times that are convenient for pharma, he said. Pharma should have activity with patients throughout the life cycle through a continuum of interactions. An in-session poll of delegates revealed low confidence that technology could reduce time-to-market. Some companies are making headway here, though. Lilly, for example, reported having cut out five years of clinical trials through end-to-end digitalisation of the whole process. There are many different ways that digitalisation can improve the efficiency of clinical trials. One example is harnessing real-time patient feedback to shape the way a trial progresses. The Christie is doing exactly that in their work supported by Kanga on the Digital Experimental Clinical Trials Team. Attention is turning to behavioural medicine and lifestyle factors for illness prevention. The challenge before pharma to fulfil its potential as a partner in healthcare is stronger than ever before. Opportunities presented by cloud-based data management, AI, advanced diagnostics, and wearables are real. They mean that pharma’s continued ability to invest in R&D to develop lifesaving medications will require a concerted effort to broaden its role and become a key partner in lifestyle and wellness. It will no longer be simply providing support ‘beyond the pill’ but looking at health from the perspective of the whole person and recognising pharma’s role as a stakeholder in our overall wellbeing and ability to live in a way that prevents disease. In summary, there’s a way to go – but the industry is changing. Historically slow to meet the needs of a digitally immersed world, pharma is now leading some pioneering collaborations, serving patients and, at last, beginning to disrupt itself from within. The sense of determination in the conference room was palpable, with glimpses of a twenty-first century driver of improved worldwide health. The theme of the conference this year, and the hashtag, was #unitepharma (although I find these special hashtags a challenge as everyone also uses #e4pbarca, so there’s 21 characters of your Tweet gone already). Why? Because eyeforpharma recognises that solving healthcare problems is complex, requiring the skills and capabilities of many types of players in this interconnected network. Some of the best examples shown in the three days involved collaboration and working together. Leo Pharma won an eyeforpharma award for their Innovation Lab which partners with technology organisations world-wide to develop digital solutions to support patients with skin conditions. 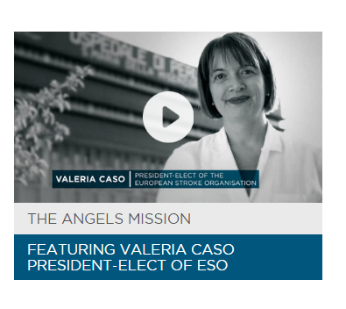 Another award winner was also a collaborative project – Boehringer Ingelheim’s Angels initiative is working with the European Stroke Association to certify 1500 hospitals across Europe as specialist stroke treatment centres, in order to save more lives. It is a bit of a myth that health professionals do not want to collaborate with pharma. We sometimes over-interpret surveys that say ‘doctors don’t trust pharma digital stuff’ or ‘doctors prefer 3rd party sources’. Sometimes this is because pharma hasn’t (yet) delivered what they want in these spaces. Alistair Grendell of QuintilesIMS pointed out that ‘85% of HCPs want more digital services from pharma’ and used clinical trial recruitment as an important opportunity area. Ryan Olohan (@RyanGOOGHealth) of Google supported this with a case study – in one example a trial had recruited just 10 patients in 4 months with traditional methods, then got the other 90 in 10 days with a search-led campaign. 2. 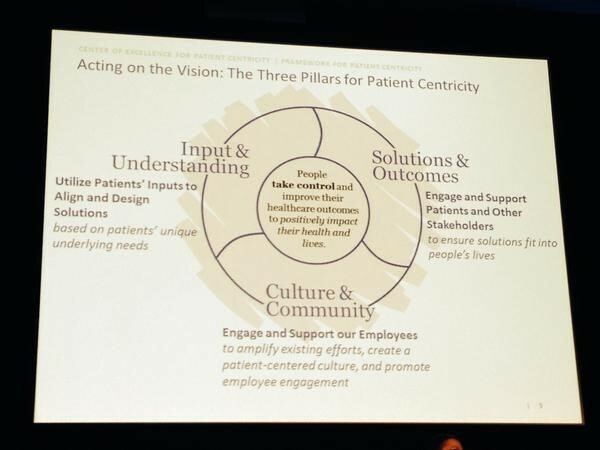 Patient-Centricity – mindset or a marketing tactic? All companies have patient-centric straplines but only a handful are demonstrably putting them into practice. On a show of hands, only about 15% of delegates thought their own company was truly patient-centric today. Google pointed out that of the estimated 165,000 health apps (mostly created by pharma), just 36 of them make up half the health app downloads. Ian Talmage (Bayer), a pharma leader of many years and a cancer survivor, had a unique perspective. He talked movingly about his brain cancer, the depression and fear that accompanied it and the long-term disability it has left him with. He was very clear that there is lots of opportunity for the pharma industry to help patients. “I didn’t want shiny leaflets, I wanted trust and involvement, my way”. Takeda won an award for delivering a service to patients, designed as a result of a direct patient need. A colleague with IBD had a long-haul flight in which the food served caused a flare-up, so Takeda created ‘FlyWithIBD’ a campaign to encourage airlines to support IBD patients by labelling food more clearly and making WC access easier. Launched with a Thunderclap, this simple but effective campaign was worthy enough to win the eyeforpharma award for Most Valuable Patient Initiative. Wendy Keyhoe of GSK described an enterprise-wide initiative to talk to patients with COPD and bring videos and images into the business for all colleagues to learn from, with a patient journey map aligned across the organisation and a ‘workshop in a box’ to help countries develop their own insights. Hats off to Nestlé Nutrition who interviewed no less than 15,000 patients worldwide in building their new commercial model based on real insights. Bruno Villetelle (@BrVill), Chief Digital Officer (very good to see one of those), described the vision at Takeda as ‘how to transform a 237-year-old company into a 33,000 people startup’. They have implemented an internal ‘Dragon’s Den’ for entrepreneur colleagues to come and ‘pitch’ their ideas and win funding. Bruno pointed out that the ‘early adopters’ can’t do it alone (I agree, see my post on Crossing the Chasm) and was challenging, saying “Pioneers do not let go. Failure does not deter them”. How many of us in pharma have succeeded in failing? GSK’s AJ Ploszay showed that to transform effectively for multichannel a pharma company needs to really change the business model. GSK does not pay doctors to speak for them and no longer rewards sales reps based on prescriptions but on customer satisfaction. Their approach to digital assets is iterative: “get a minimum viable product to marketplace, see what customers think and build from there”. He pointed out that so many of our approvals processes were designed for print. Don’t try to fit into it, change the process, he said. I agree, an agile test-and-learn approach has been done in pharma and it works. Fabian Mettes of Amgen showed the importance of consistent measurement in delivering transformational change. They are implementing a common KPI framework (‘Brand 360’) across the organisation and this is allowing the sharing of best practice and learning, and the linking of ‘multichannel performance’ with sales results. 4. #BeBoldForChange: Glass Ceiling or Sticky Floor? A disappointing observation at Barcelona was the very unbalanced nature of the speaker faculty. 80% were men and all opening and closing keynotes were male, as were all the ‘Lifetime Achievement Award’ finalists. It is a shame to learn from eyeforpharma that they tried really hard to get a more representative speaker list but companies overwhelmingly put forward men for the task. Why is this? Even the session on gender parity, ably led by Magdalene Pederson of the Healthcare Businesswomen’s Association, was not as well attended as it might have been. This is a productivity issue and men as well as women need to stand up and campaign for better diversity and equality in our organisations, particularly at a senior level. In an industry dominated by women (especially in commercial roles), whose customer-base is dominated by women (80% of healthcare decisions are made by women according to the HBA), women should have a fair share of leadership and decision-making. There is no lack of ambitious or able women in our industry. The problem goes deeper than that. Magdalene pointed out that there is a glass ceiling for sure – the built-in unconscious bias on the part of male senior hiring managers that “she won’t want that more senior role because she has children and will not want to travel…” or “if I promote her she’ll just get pregnant and leave me in the lurch” – without actually asking the woman about her own ambitions and preferences. These doubts and questions do not apply to men! Companies must go beyond the letter of the law in having equality policies that address this very real bias. In addition to this Magdalene told us, there is a ‘sticky floor’ – the women who get promoted, it seems, often get paid less than their male counterparts for the same job. With little pay transparency in industry this is often a hidden problem – but also needs addressing. Once again, unconscious bias rather than policy is the biggest problem in terms of the gender pay gap. Paul Simms, CEO of eyeforpharma, has issued two newsletters on this topic and called for improved equality across our industry – “if we’re to fully deliver on patient outcomes, we must be representative of our patient population.” Interestingly the only negative feedback Paul’s had so far has been from a handful of men, illustrating, I think, that it is very difficult from a position of privilege to see the impact of prejudice. I call on all women and men in our industry to call this out, challenge their organisation and show leadership in driving for better equality in the interests of our future and that of the patients we serve. Let us all #BeBoldForChange! Check out the statements below. Familiar? We tried a website with brand <x>, and it didn’t work, so we’re not going to build another’. ‘We have got too many websites; we need to reduce the number’. Have you ever heard comments like these? Why is it, in pharma, we blame the channel for our shortcomings? ‘We tried a sales rep with brand <x> and it didn’t work, so we’re not going to hire another’. ‘We have got too many telephones, we need to reduce the number’. Clearly in these last examples it is silly to blame the ‘channel’ for our own poor execution in it (and questioning the ‘number’ of assets alone is meaningless) – so why do we do this for websites? Customers’ behaviour is universally search-led, with Google (a website) ubiquitous in most of the world. Google penetration amongst HCPs is 100%, most of them using it several times daily. The most common things customers do on their smartphones is check email, text and yes – search the web and browse websites. The most common needs are content driven – information, education, guidelines, FAQs, expert advice. In almost all therapy areas the landscape is fairly barren. Customers are simply not finding the content and services about therapies and medicines that they are looking for, in formats they prefer. In other words, there is a lack of good quality websites. If we are going to meet customer needs with compelling content in formats convenient for them, this means the cornerstone of our digital investment should be – you guessed it – good quality websites. This will likely be a combination of a presence on 3rd-party sites (where we will reach users interested in the topic and hopefully engage them with our content – this is like going to a congress and getting them to come to our symposium) and our own websites (this is like having a stand-alone meeting and inviting customers interested specifically in our TA or brand) – there is a place for both of these. The key phrase here is ‘good quality’. The difference online is that ‘your competitor is just a click away’ so we have to execute with excellence and deliver an outstanding user experience in order to provide what our digital-savvy customers need and expect. There is a lot to get right, and this requires work. Get it right, and you’ll be delivering what your customers want at the most crucial moment for them (when they are actively looking) and on their terms. So our focus as pharma marketers, before we build that innovative adherence app or enjoy the excitement of crowdsourcing an awareness campaign or wow HCPs with our latest virtual-reality game – should be occupying that first page of Google with our content on our websites, serve their needs and make the most of the relationship that ensues. That is how your own the digital landscape for your brand. Bring back the website! 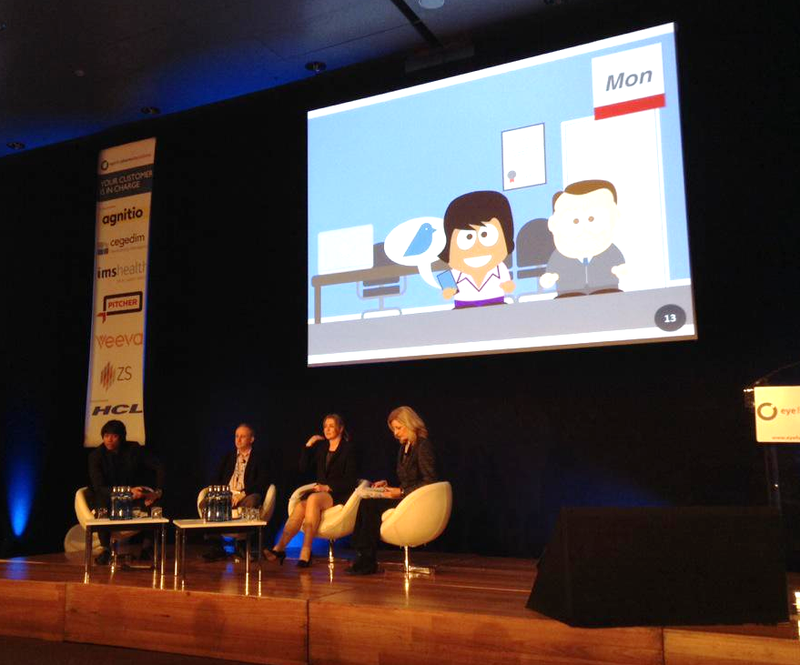 Eyeforpharma Barcelona 2015 – the Tipping Point? There are a few themes we have been discussing in the pharmaceutical industry for a long time. The transformation of our businesses for a digital world. The need to put the patient at the centre of everything we do. The fact that our customers, health care professionals, are no longer interested in the same old ‘push’ messaging and need a completely different relationship with us. At this year’s eyefopharma Barcelona, after 15 years of ‘talk’ I felt we had reached a ‘tipping point’ – things are really happening, we have measurable results, we have stopped talking and started taking ACTION. There is a good deal of work still to do, but at last it has finally begun in earnest. With the much-cited 2014 ‘tipping point’ of over 50% of HCPs now ‘digital natives’ (PMLive/LBi) perhaps it was bound to happen. But it was very encouraging to hear people who are making change happen across our industry, for the benefit of those taking medicine and living with health conditions. Indicative of this was the fact that eyeforpharma (@eyeforpharma) invited both healthcare professionals and patients to the conference, and they were invited to ask the first questions in each session – a nice touch. GP Julian Spinks (@JulianSpinks) and Consultant Endocrinologist Partha Kar (@parthaskar) made it clear that in a doctor’s busy day, information and education need to be concise and available on their terms as and when needed. Ashfield Health worked with them to understand ‘a day in the life of a GP’ and ‘a week in the life of a specialist’ and it became clear that traditional educational formats no longer serve physicians. They blog, tweet, Google and game for professional development. Julian described a 45 minute compulsory ‘safeguarding’ elearning module he had had to complete on a Sunday as he could never fit it into his working day (50 patients, 7am to 7pm). Julian described himself ‘as a bit of a dinosaur’ but on Day 3 of the event I had an audience show of hands ‘Who Tweets?’ – less than 15% of eyeforpharma delegates. Julian tweets regularly. Our customers are leading the way. If we are going to engage our customers, we have to ‘stop standing on the edge of the Grand Canyon and yelling’ said Craig Fiebig from IMS. The importance of delivering great content and letting customers utilise it on their own terms was a recurring theme. Lundbeck have developed an elearning platform to help embed good content marketing skills across the organisation. Lanre Ibitoye gave a number of practical ways they have achieved this focused on McKinsey’s three ‘c’s of customer satisfaction: Consistency, Consistency, Consistency. Lundbeck develop content that is easy to share across many channels and they work with customers to predict future content needs, rather than just asking customers ‘what do you want?’ – then they learn and iterate over time. They also have both a ‘localisation’ and a ‘globalisation’ process so that ideas working well in one market can easily be rolled out. Lundbeck’s focus on measurement was impressive – spend 30% on content, 20% on promotion and 50% on measurement – this is how you learn and improve. Peter de Jong of Elsevier presented some interesting customer research on content usage. Google is now ubiquitous at 100% usage, and interestingly, ‘manufacturer’s websites’ are used by 90% of physicians. He also observed that 61% of content consumption is on personal, not work devices, echoing our busy doctors who told us most of their CME has to be in their own time. This was said by Pablo Ouro Villaravitz from UCB and it was music to my ears. For too long we have been asking ‘how can these other channels support the rep’ where in fact the field force is just one of many channels. As I showed in my introduction to Day 3, customers now spend less than 5% of their information seeking time in ‘face to face’ interactions but an audience poll in the room showed the majority are still spending 90% of their budget on F2F. Why is this? Cegedim’s study showed a 55% increase in eMeetings and 23% decrease in F2F meetings with customers, but still only 3.3% of overall sales and marketing budget being spent on digital. Len Starnes (@LenStarnes) discussed the future of congresses for the now ‘digital native’ HCPs. The recent ESC event had 300,000 unique visits to its website – more than 4 times the ‘real-life’ membership of the ESC. 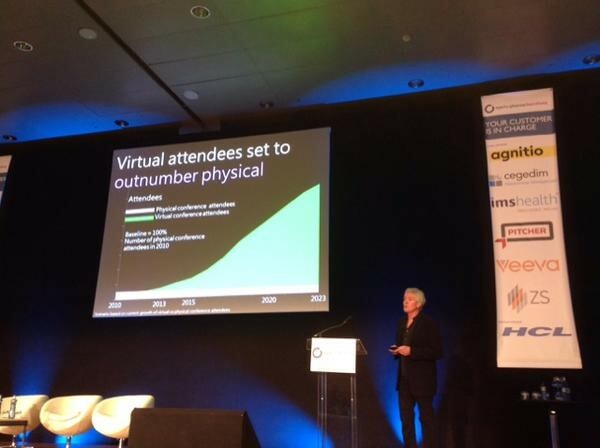 ‘Virtual’ has already exceeded ‘physical’ in spite of the congresses own reticence to engage – many will not yet make content available online for fear of impacting attendance, although some are looking at ‘virtual booths’ to complement physical exhibits. This reminds me of the reluctance of major media owners in the 1990s, as the newspapers struggled with ‘free news available everywhere’. Only the astute players who recognised the importance of high-value content and the conversation and engagement it can generate, survived the digital revolution. It is inevitable for medical congresses too, and ASCO has embraced this for years and leads the way with Twitter feeds, blogs and online content. There are immediate opportunities for pharma here, with ‘overnight congress reporting’ and ‘symposia summary videos’ being delivered or sponsored by some companies. As rules on sponsoring doctors to attend events tighten, companies are bringing the content to their customers. UCB described three business models: ‘Multichannel’ (by which I think they meant ‘digital’), ‘Hybrid’ and ‘Empowered F2F’. Clearly the cost for the last is the highest so they save this for the most high-value customers but believe they are having a significant impact on market share with all models. AstraZeneca created brand archetypes (e.g. ‘Launch’, ‘Star’, ‘Fortress’) and built the channel mix around these based on customer needs and potential profitability. 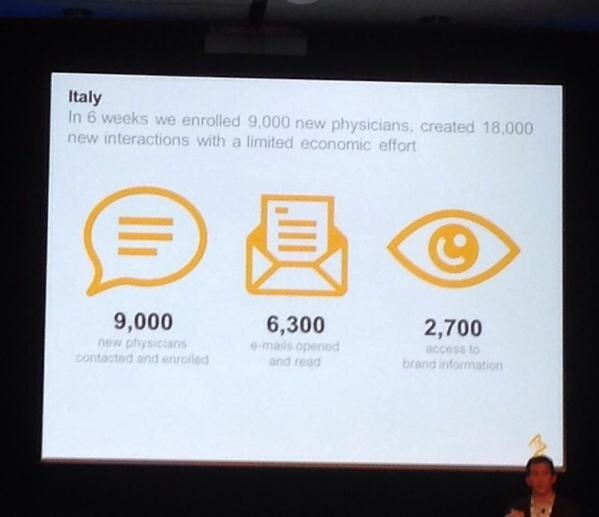 Like Lundbeck, AZ ruthlessly measured and learned along the way, with one pilot in Russia demonstrating a 17% increase in sales with their multichannel approach and in Italy generating 18,000 customer interactions in just 6 weeks at modest cost. An interesting comment from Rosa Maria Lopez of Boehringer Ingelheim, who is new to the pharma industry and said ‘before I came to BI I had never heard the phrase ‘multichannel marketing’ – I just called it ‘marketing’’. Quite. This was one of the patient guests at eyeforpharma. All the patients expressed how important it is to have dialogue with industry and that we need to collaborate more. This was very refreshing and many speakers reflected this new optimism for a better partnership. Anne Beal (@acbeal), Sanofi’s new Patient Engagement Head gave an inspirational overview of their strategy, admitting that that ‘We don’t know all we need to know but we are determined to learn’. In Sanofi there is a drive from simple Patient focus to patient engagement and ultimately patient empowerment, said Anne, and her Centre of Excellence is a catalyst but everyone in the organisation needs to be doing this. The Sanofi core values are about Transparency, Partnership (not ‘to’ patients, ‘with’ them), Continuous Learning and Development and Focus on Outcomes & Impact. Anne’s goal, similar to that expressed by Tim White head of Customer Engagement at Lundbeck, is to be ‘redundant’ because this way of working is embedded across the organisation. The Patient Vision for Sanofi is ‘People take control and improve their healthcare outcomes to positively impact their health and lives’. Note that they refer to ‘people’ and not ‘patients’ – this was also a theme, and reminded me of my eyeforpharma presentation 2011 looking forward to 2016 and saying by then the thinking will be ‘the Patient is dead, long live the Person’. A reality already? Bayer’s Jesus del Valle heads up Bayers Grants4Apps program that sponsors start-ups with innovative healthcare ideas. His panel discussion led to @thomas_thinks reflecting on the fact that ‘Pharma says ‘patient’, start-ups say ‘people’. That’s why person-centred innovation won’t come from pharma’. Sanofi’s action plan consists of embedding people centricity in the Culture and Community, offering real Outcome-based Solutions, and learning in order to get real Input and Understanding. A blueprint for the industry, maybe? This and a panel debate about ‘disruptive innovation’ stimulated a hot Twitter debate about how patient solutions should be funded when companies are focused on the lifecycle of individual brands. Should there be a collaborative approach organised by health providers/patient organisations with companies working together or co-sponsoring? There was a Patient Engagement track at the conference as well as the Multichannel, Sales and Value tracks but the observations here are from the Multichannel track and it was refreshing that even here the patient/person was at the centre. Gilles Pluntz from Ferring summed up why: ‘In countries where we have high patient engagement, sales grow, and where we don’t, they don’t’. Sarah Bentley (@saraheb) kicked the conference off wearing a Tweetskirt, which all the girls immediately coveted. Its LED patterns changed, responding to tweets. Not sure of the application, but it was cool. At the end of the day Marcus Mustafa (@dacrumb) showed a tableaux of wearables, from glasses used by Virgin check-in agents to welcome passengers by name, to self-protecting underwear that detects ‘rough’ handling and electrocutes the attacker. Of course there are many applications in our own area of health and Marcus showed several – the ubiquitous FitBit, contact lenses that detect blood sugar levels and send signals to an insulin pump, and beyond wearables to ingestables like electroceuticals, drugs with chips that detect body chemistry. This was the hot topic of the day, introduced by Sarah who pointed out the digital native generation will not tolerate poor experience – they expect seamless usability and immediate gratification. Sarah’s 5-year-old daughter single-handedly bought a Hello Kitty Umbrella online, only letting her mother know of the purchase because she was cross it had not arrived immediately. Anthony Mayfield (@amayfield) pointed out that we used to organise around the message, but now we must organise around the consumer and their needs. Newer businesses are doing this, he said, because they don’t have legacy systems or legacy thinking. Jason Mesut (@jasonmesut) focused on user interfaces and pointed out that they are not just ‘web-based’ – but include, ‘knobs, knockers and switches’ too. Think about your user as a human, not a customer, he said, and used the beautiful video from Corning ‘A Day Made of Glass’ to illustrate the opportunity to create immersive experience. He asked us to ‘prototype out loud’ and make mistakes in order to learn what works. There is no one ‘customer journey’, Jason said, we must find ‘moments of truth’ throughout the ecosystem. Minter Dial (@mdial) showed a number of examples of retail immersive experience, with mixed success. Vanquish store in Tokyo lets you take a funky picture of yourself using a mirror and uploads it to their Facebook page – you Like the page to share it. But execution is everything, Minter said, citing an example of another retail app, to ‘build your dream bra’ in a lingerie store, failing to work correctly. The problem is that management doesn’t test the user experience, he said, they think it is someone else’s job. The importance of data to drive experience was clear. Rapid test-and-learn is critical to create the right product for customers, said Wendy Tan White (@wendytanwhite). This point was picked up by Ottokar Rosenberger (@OttokarR) in a session on agile marketing – we should have KPIs around the speed of iteration as well as customer outcomes. In our effort to drive agile marketing with data we must focus on consumers – ‘we have to start respecting people and their attention’ said Anthony, we are all turning into ‘cryptoconsumers’ protecting our data carefully. We are increasingly being analysed, from black boxes in cars for insurance companies (@agwp) to the Watson computer searching 29 million PubMed articles for potential cancer cures (@ibminteractive). As Otto said ‘We should be data driven to optimise the curve but passion driven to shift the curve completely’. Doug Kessler (@dougkessler) gave a thought-provoking talk about the future of content marketing, pointing out the blurring of content and advertising, but the counter-trend of the ‘return of the editor’ as providers try to build trust. 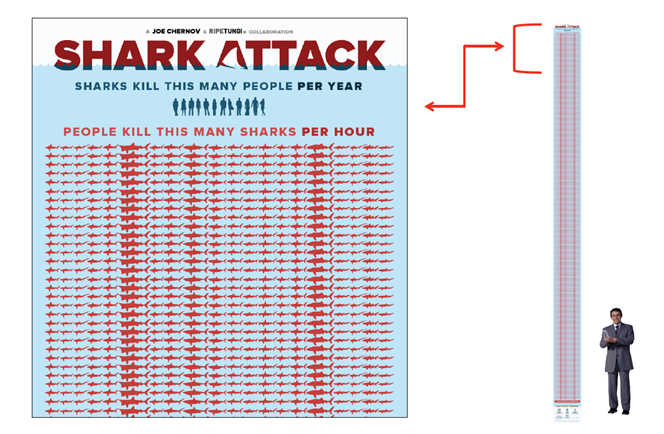 He also pointed out that when the head and heart combine – strong rational argument with huge emotional hook – you have a ‘home run’ of impact, using the Shark Attack stats as a great example. We can use this more in our health campaigns. We are data-rich but often forget that health issues can invoke a strong emotional response, for patients, caregivers and sometimes healthcare professionals. Neil Perkin (@NeilPerkin) agreed that editing and curation is key – ‘it’s not about information overload, it is filter failure’ and identified 3 pillars of content curation – Professional, Algorthimic and Social. Talking of algorthi mic filters, the Hummingbird release of Google has brought this to a new level, with an algorithm that provides answers to questions (‘What time is the match on?’) and the algorithm learns as it goes – even the Google engineers don’t know how it works anymore, pointed out Will Critchlow. (@WillCritchlow). Malcolm Coles (@malcolmcoles) illustrated Trinity Mirror Group’s approach to contextual marketing in their Us Vs Them Campaign – instead of pushing content the campaign builds irreverent engagement around topical issues. For example, they asked people to find Damascus on a map just before the US bombed it. Another tactic was their ‘how much does the Daily Mail hate me’ game. Barney Leohnis gave us ‘a glimpse inside the incredible, wild and exciting world of Digital China’. Every aspect of Chinese life is being transformed and digital is the enabler of this change. The internet is seen as the route to the outside world and China has 3 of the top 7 internet companies by value. Taobao the ecommerce site, delivers more packages per year than UPS worldwide, and ‘it’s everyone’s dream to make a mint on Taobao’. In a country of state-controlled newspapers the internet is the most trusted channel for product information and phone start up Xiaomi sold 100,000 phones in 83 seconds through social flash marketing. The technology isn’t cheap but its desirability is clear – people will eat rice for 4 months to be able to afford an iPhone. The empowerment is so valuable that, in Barney’s words, ‘the Chinese don’t give a crap about user experience’. The digital empowerment has many facets – for example the ‘Diaosi’ movement – a social media-fuelled rebellion against the overwhelming pressure to succeed in China’s emerging middle-class with hot-housed education and huge expectations of the single child in the family. In healthcare, the huge challenge of cost outstripping income has created a massive online counterfeit medicine scandal. Transformation was a theme throughout the event with Anthony pointing out that the CEO must lead the transformation, and several speakers agreed with him that digital transformation is not a campaign, it is a whole new thinking – about ‘inbound marketing instead of ‘outbound’. Sarah insisted the CMO must take ownership – only 1% of companies going through a digital transformation have the CMO in charge of it – and predicted that in a few years digital should be 75% of marketing spend. In the pharmaceutical industry, where risk-aversion is often rewarded, promotion is highly regulated and a large portion of spend is still invested in a highly-qualified sales force, transformation of mindset and model remains a challenge. The full list of speakers and their organisations is on the Econsultancy website. Also see 48 quotes from FODM and a selection of the FODM presentations on YouTube.